Do you know how to make Panna Cotta? This sweet and smooth dessert you can have in most of the Italian restaurants? Does it look complicated? I promise it is not, and I will give you the secrets to prepare a delicious and impressive Italian dessert! Actually, I taught to Dutch people last week how to make it in my first cooking class given in English and in the Netherlands! I was surprised that most of them never heard of it,... They all loved the dessert and found really easy to cook and repeat at home! So I am sure that you can do it also! Do you know what "panna cotta" means? In Italian, it means "cooked cream". This is a traditional dessert from the Northern part of Italy where dairy products are widespread. Put the jelly sheets in a bowl with cold water to smooth it. In a pan, we put the cream, sugar and the vanilla opened in the vertical way in order that the small grains can mix with the cream. We heat slowly till boiling. Then you take the cream off and take out the vanilla pod. Add the jelly you pressed in your hands before to let it melt in the hot cream and then pour your panna cotta in individual glasses or bowls. Keep it in the fridge for at least 30 min if you used agar-agar or 2 to 3 h if you used regular jelly! You can prepare a nice fruit coulis, heating in a pan the red fruits and sugar during 5 minutes. You can use frozen or fresh fruits, mix red fruits, or only have raspberries. You can also serve your panna cotta with chocolate or caramel sauce. 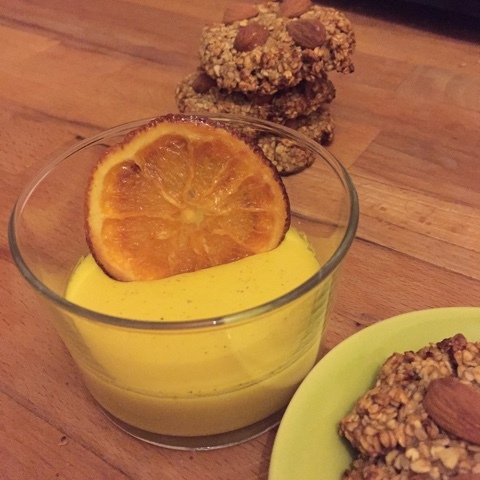 Last Christmas, I did this exotic version, with a coconut flavoured panna cotta served with passion fruit coulis and and a homemade crystallized clementine.... Amazing!